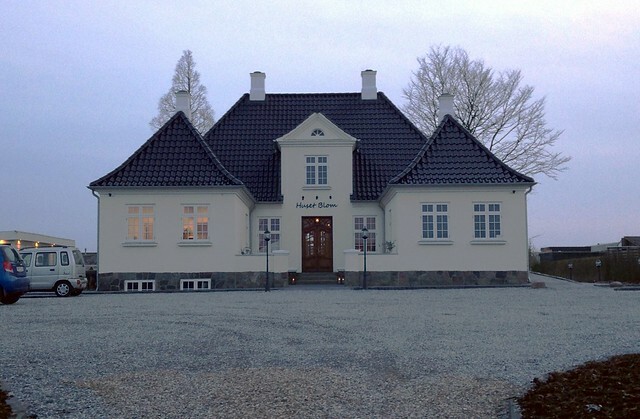 The start of 2014 saw some movement in the restaurant scene in Sonderborg away from the central ‘town hall’ area. The restaurant Huset Blom opened in the middle of an unassuming residential area in an old, newly-restored villa from 1924. 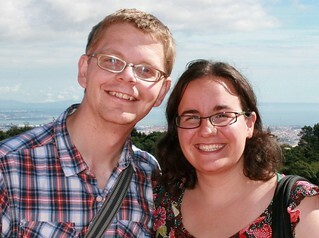 The restaurant is run by Pia & Klaus Bartholin who also run Cafe Alsion. Living very close to the restaurant, we decided to try it out for Valentine’s Day. It was clear from the start that the service we will get here would be above that you normally experience at other restaurants in town. We were greeted with a smile, and courtesy, our jackets taken and hung, and then shown to our seats. Seeing the building from the outside I expected the place inside to be decorated in a more traditional style, so it was pleasant to see a clean decor and plenty of space to move around in. This was served in 4 courses on sharing platters, with homebaked bread and butter offered throughout (and continuously replenished! An utter delight for a Maltese girl in Denmark!). As the saying goes, people first eat with their eyes. And there was more than enough for the eyes to be well satisfied. Unfortunately we only remembered to take photos of the first dish as we were too busy enjoying the food, but in all cases the presentation was a joy. The taste was not far behind in coming. 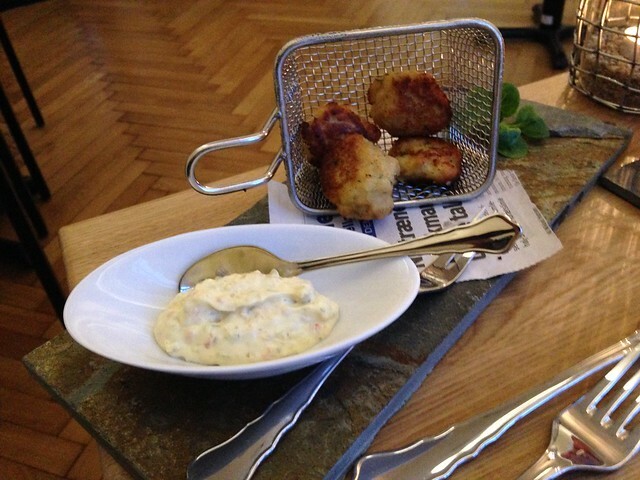 We both agreed that our favourites were definitely the fish cakes – the remoulade was superb – the potato cakes – surprisingly overshadowed the pork cheek as they were so good – and the honey cake with almond ice cream – I love almonds and everything that is made with them, but the ice cream was divine! The set menu comes with a suggested wine menu, which Michael went with, while I opted for elderflower juice. There are also wine suggestions to go with the a’ la carte option. With every course Michael received a glass of wine and the waitress explained what the wine was, where it was coming from, and other interesting facts. At this point it was clear why they do not take a lot of bookings at the same time as the serving is quite intensive. The servers really take their time to make sure that you know what you are getting, without getting in any way intrusive or overbearing. 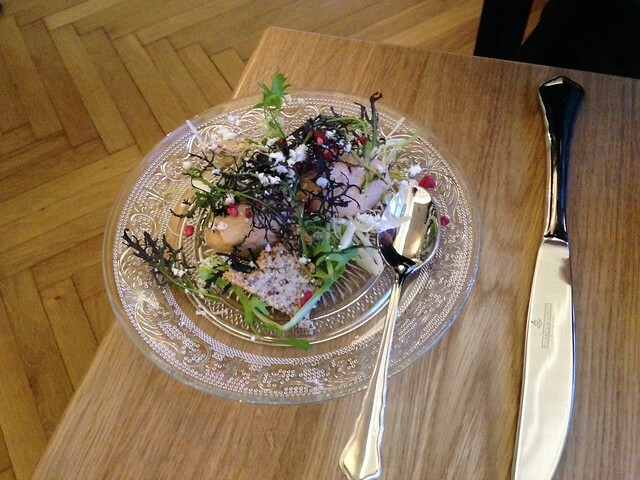 It is a pleasure to see something new and different on the food front in Sonderborg itself. The quality is definitely a notch up on most of what is found in the town centre. The restaurant also seems to be targeting the business crowd more by not opening on weekends, but opening for lunch. The cost, as is to be expected, is higher than most other restaurants in town, so probably a place for a special treat rather than a quick weekday lunch. For the foreigners out there, the menu and the website are, unfortunately, still all in Danish. However, once you get there, the servers were more than happy to explain things in English. At this point we really should mention Irene, our server, who did a terrific job all night of serving us with a smile and an obvious joy for what she was doing. This entry was posted in Food, Restaurants and cafes and tagged Danish food, new in town, restaurant, restaurants by Ann. Bookmark the permalink. Sounds great! More dining options are much appreciated!